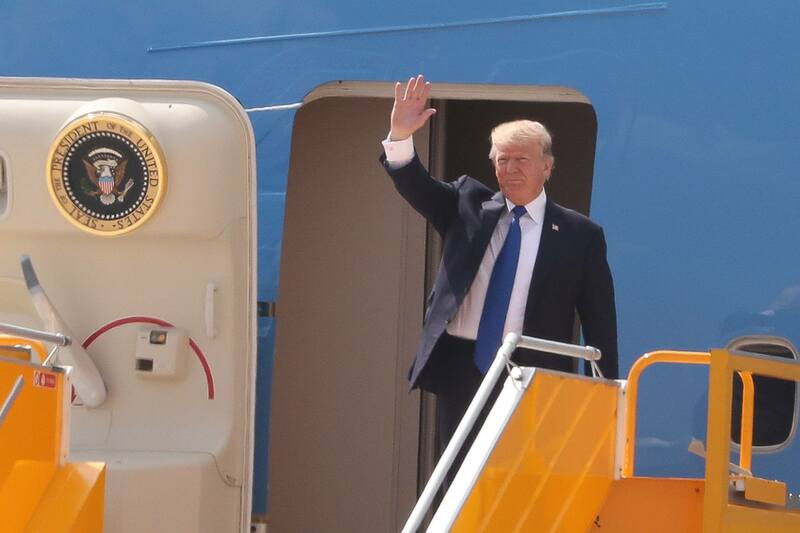 U.S. President Donald Trump’s Air Force One landed in Da Nang at 12:15 pm on Friday, as the leader commenced his three-day working schedule in Vietnam. After the president's landing, Vietnamese Minister of Communications and Information Truong Minh Tuan greeted the U.S. leader at Da Nang International Airport. The president headed straight to the Ariyana Danang Exhibition & Convention Center, where he is scheduled to deliver a speech at 1:30 pm in front of 2,000 delegates who are attendees of the 2017 APEC CEO Summit in the central resort city. First lady Melania Trump does not accompany her husband to Vietnam, as Beijing was the third and final leg of her trip to Asia with the president, the U.S. head of government said on Twitter. "Melania is staying behind to see the zoo, and of course, the Great WALL of China before going to Alaska to greet our AMAZING troops," Trump said. I am leaving China for #APEC2017 in Vietnam. @FLOTUS Melania is staying behind to see the zoo, and of course, the Great WALL of China before going to Alaska to greet our AMAZING troops. Established in 1989, the Asia-Pacific Economic Cooperation (APEC) is a regional economic forum comprised of 21 Pacific Rim member economies. The group’s annual summit is hosted by Vietnam’s Da Nang this year, with a range of activities leading up to the leaders’ meeting on Saturday. The two-day APEC CEO Summit commenced on Thursday, with the participation of thousands of key business leaders and world diplomats from member economies. President Trump’s speech at the CEO Summit is expected to deliver a clear message on the United States’ policies on Asia-Pacific issues. Chinese President Xi Jinping is also scheduled for an address at the same forum, while Japanese Prime Minister Shinzo Abe would not be giving his speech as arranged in the initial schedule, according to the latest announcements. Thousands of people have lined up outside the auditorium at the Ariyana Danang Exhibition & Convention Center since early Friday morning in the hope of getting a good seat for the grand event. This year’s APEC CEO Summit is the biggest ever held in terms of the number of participants, officials say. In Vietnam, President Trump will join APEC activities on Friday and Saturday, including an anticipated sideline meeting with his Russian counterpart Vladimir Putin to discuss anti-terrorism, Syria and North Korea. On Sunday, the U.S. president will fly to Hanoi to commence his official state visit at the invitation of Vietnamese State President Tran Dai Quang. Trump is slated for meetings with President Quang, Party Chief Nguyen Phu Trong, and Prime Minister Nguyen Xuan Phuc during his stay in Hanoi. After Vietnam, the U.S. leader will fly to the Philippines to attend the East Asia Summit in Manila, where he will be joined by leaders of the Association of Southeast Asian Nations (ASEAN), Japan, China and Russia. Manila will also be the last destination in the U.S. president’s Asia trip that began on November 5 and includes stops in Japan, South Korea, China, Vietnam and the Philippines.